Richard Feynman is a cult figure among those who teach or write about science. A Nobel Prize winning scientist, his special genius lay in being able to explain very complicated science very clearly. Like a razor, his mind cut right through the forest of terminology and conditional hedging obfuscating an issue, cleanly piercing to the core of the key idea, and like a gem he would hold it up for you to see in all its simplicity and beauty. 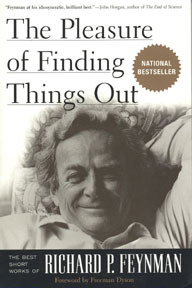 The Pleasure of Finding Things Out is a collection of the best short works of Feynman. It includes many short lectures, and one absolute diamond. Called The relation of science and religion, it is a short (12 page) stunningly-reasoned commentary on the nature of the difference between these two ways of seeking for truth. It is not often that I encounter writing that causes me to seriously re-evaluate my thinking about such basic issues. Reading this short essay is the most important half hour I spent last year.